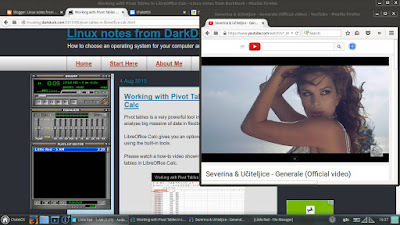 The recent review of Xfce Smooth Linux distribution was a hit among my readers: it got a lot of views. Soon after that review went live, I talked to distribution author and he pointed me to yet another interesting Linux distribution that he liked. I followed the link that he provided, and decided that the distribution deserved some attention. Let me introduce you to Chalet OS. The web site of this operating system says that their main target audience is fresh Linux converts who come to the Linux world from other operating systems. Isn't it the same audience that Zorin OS is aiming at? I was baffled and intrigued! 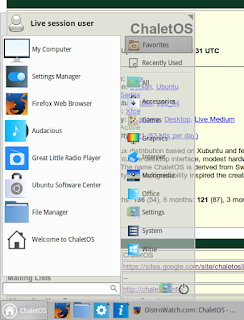 The latest version of the Chalet OS distribution has the number 14.04.3, which gives us a proper clue that Chalet OS is actually another offspring in the Ubuntu family. This version was released in August 2015. I downloaded the 64-bit version ISO, which is about 1.3 Gb in size. You can get it either using a direct link, or torrent. I used the Ubuntu's built-in tool to "burn" this ISO image to the USB stick. The USB drive is plugged into the port of my Toshiba Satellite L500-19X. Reboot. Choose to boot from USB. Let's go! Once the boot process starts, you have a menu with few options in them: start Chalet OS in Live mode without any configuration changes, or with some additional parameters, or go straight to the installation. There is no option for memory check or HDD boot in that menu, which I used to see in many other distributions. The boot process itself is reasonably quick. It was not too long before I saw the welcome screen of this operating system. The first thing that you can see when the boot sequence finishes, is an error message. It spoils all the expectations that you may have from your new toy operating system. The message in the centre of the screen says that there are some missing components in the language pack. What? I haven't selected any languages, and the system booted in English, which is the default. Why are there any missing components? Apart from that message, you have a wallpaper in light-grey tones with a Chalet OS system logo in the centre. Other than the default background, you may choose from a set of several dozen images. 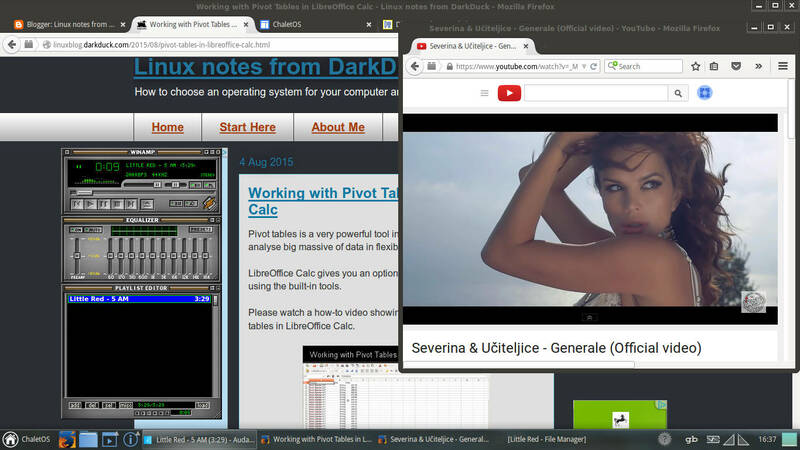 Some of them are Chalet OS-, while others are Xfce-inspired. There are some nice photos too. If you can't choose any of them for your liking, why not check some of my own photos? Maybe you like them more. The top right corner of the desktop is taken by the clock and calendar widget. There is a panel at the bottom of the screen. The right part of the panel is taken by the notification area, where you can find a weather forecast widget and some usual suspects: keyboard layout, battery, volume and network indicators along with clocks and the "Show desktop" button. The network and volume indicators actually look very strange - they are just two triangle icons that don't give you a clue about their purpose until you click them. This isn't the best design, as I understand it, for system usability. The weather widget in the panel understandably does not work without network, which isn't available right after boot. It showed me a big question mark instead. The left part of the panel is taken by the menu button, which is followed by the shortcuts to Firefox, File manager and additional drop-down menus with utilities and Chalet OS informational links. If we remember that Chalet OS is intended for Windows migrants, then I would expect the elements of these operating systems to be similar. At the same time, I struggle to remember where I could see the drop-down panel menus in Windows. Are they at all there? The whole desktop palette is in grey and white tones, which isn't very contrasty sometimes. For example, the white title of the current window is not too visible on the light-grey background of the panel button. 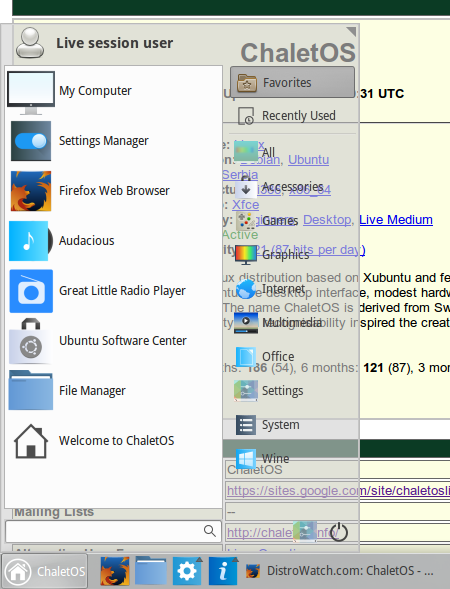 Chalet OS is based on Xfce, and you can definitely see it from the default menu. It has a standard structure with categories on the right and menu elements in the left panel. Again, this is not the structure you can see in Windows operating system, but let it be. On top of that, the background of categories section of the menu is almost fully transparent. Now imagine that you open the menu on top of an application with lots of text. In short, there are several doubtful design decisions made by Chalet OS developers. On the positive note, Chalet OS comes with a special tool, Chalet OS Style Changer, which you can find in the Settings section of the menu. It works similarly to the Zorin OS Theme Changer, but has many more "styles" available. It also allows you to configure the Conky element on the screen. The freshly booted system used about 333 Mb of memory, which is quite a lot for the Xfce-based distribution. But it is still a better result compared to Zorin OS 10. I had no issues with connecting Chalet OS 14.04.3 Live to my home wireless network. Once I identified the network indicator on the system panel, which was a difficult question I have written about just above, I selected my home network, typed in the password and connected in no time. Chalet OS, like many other Ubuntu-based distributions, has no issues with connecting to the shared network drive. It was a simple process in the Browser Network section of the file manager. 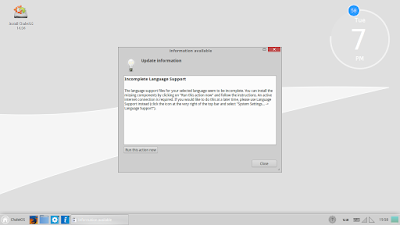 Chalet OS comes with English US keyboard layout activated by default. There is an indicator with "US" letters in the bottom right corner of the screen. If you need to change it, right click on that indicator and select the Keyboard Settings context menu item. Then you can follow the instructions for Xfce keyboard layout setup. Touchpad scrolling is enabled in Chalet OS 14.04.3 by default. Chalet OS comes with many applications in different categories. Firefox 39.0.3 is the default browser. It is a bit outdated, but still OK for browsing. It comes together with some other Internet tools: qBittorrent client, Thunderbird email, Pidgin messenger and Great Little Audio Player, which is developed by the same person who is behind the Chalet OS itself. There are no office tools installed in the Chalet OS, apart from PDF viewer, dictionary and Great Little Book Shelf library manager. That's a big omission in my view. One of the main Linux "selling points" is that is always comes with an Office suite, most often LibreOffice, and user does not need to install it separately. This is not the case for Chalet OS. As a consequence, Chalet OS opens OpenDocument-formatted files, like .odt or .ods, as... archives! Yes, technically speaking they are archives with their internal structure. But you would be able to neither edit, nor even read that text without a proper editing tool. Graphic tools include GIMP editor, image viewer, scan utility and the same Document viewer. There are 2 simple games in Chalet OS default distribution: 2048 and Solitaire. There is also the PlayOnLinux utility, which allows you to play some Windows games. Apart from PlayOnLinux, there is also a special section of the menu called Wine, where you can find various Wine-related items. You can even run Notepad directly from there as an attempt to prove that Wine works. Unfortunately, Wine asked me several questions about various missing components when I tried to launch Notepad. It means that you can't use this tool straight away. However, Notepad worked fine after necessary components were installed in my Live session. Still, there is a question as to why the components are not in the distribution from the very beginning? Multimedia tools in Chalet OS include VLC player, Brasero burning tool, Audacious player, Audio recorder, Cheese web camera utility and Pulse Audio Control. Audacious player, funny enough, comes with a very interesting skin. Follow me to the Multimedia section and you will see it on the screenshot! Of course, there are many system utilities and tools: GParted, BleachBit cleaner, Archive manager, Calculator and other usual suspects. As you can see, there is a lot of different applications just under your fingertips. On top of that, the whole set of Ubuntu repositories and PPAs are available for you too. Even though Adobe Flash installed in this relatively new distribution, I had an issue with using it in Chalet OS. Firefox blocked the flash ads, and showed me the error instead: Adobe Flash is outdated and requires an update. As an option, you can overcome the error message and let the installed version run. Also, Volume control in Chalet OS comes with the "mute" checkbox ticked. You need to untick it before you're able to play any audio files or videos with an audio track. Other than that, I had no issues with playing videos either in full-screen or embedded mode. And yes, WinAmp player that you see on this screenshot is just a skin that hides the Audacious player. Chalet OS has a very strong and reliable base: Ubuntu 14.04. That's why you should be absolutely sure that you have very little or no issues with running this distribution. Errors, if any, should be resolved relatively easy. At the same time, design issues that comes in the default view of this operating system makes me doubt that fresh Linux migrants will be happy to stay with this operating system. Of course, some of them can be fixed by changing the system style. But that it the default look that makes the first impression. I wish Chalet OS could fix these small issues that I mentioned in this review, and become a real competitor to Zorin OS, which still remains #1 system for fresh Linux migrants. If you want to try and to assess Chalet OS yourself, why not order a disk with it through the BuyLinuxCDs.co.uk site. This distribution is not listed on sales pages currently, but you can contact me with your queries, which I happily reply to. Having never tried the OS myself, this sounds like a fair review. The only unfortunate part is the adobe flash plugin, which I can understand the frustration of having an out of date plugin by default, but... sadly... you can thank adobe for that, the only way to get a more up to date flash on Linux is with pepper flash and google chrome, and that goes for all Linux distributions. There are some distributions that stick to Firefox that isn't pepper-enabled. Some even migrate from Chrome(-ium) to Firefox, like the recent Zorin version. Thanks for agreeing with my review in principle. That is not true you can use firefox with pepperflash + freshplayer. All this is a marketing ploy by adobe and google and the suckers fell for it as usual. However, installing Freshplayer in Ubuntu 14.04, which Chalet OS is based on, is a nightmare. In either case, it's not in the default distribution. I think the criticisms of ChaletOS on this topic are totally unfair and were created with a lack of knowledge. Good you found your refuge area with ChaletOS. PS. Zorin is version 12.1 now. Hi DarkDuck , Well I have my brother Asus Discover thin and I load Chalot os to, It worked fine for a while but would not keep doing the up dates. And he started complaining . He liked my Linux lite so I tried to load that over the top of Chalot os . Guess what it keeps loading the chalot straight past the usb bootable os , even thought I had corrected the boot order in the bios. It seems the Chalot stays term and stay resident in the machine and does not allow you to change the os. That is plain sneaky. I have not as yet found a way round it. Have you asked about this in Chalet OS or general Linux questions' forum? As someone who first tried Zorin (paid for the ultimate version), Linux Mint and Chalet, I have to say I found Chalet much easier to use, learn & functional then Zorin. That's only my personal opinion. I still use Chalet & Mint. No longer use Zorin. I cut my losses and went with what I felt better. Everyone has it own path to ideal. Unfortunately the path to ideal can be long and arduous! I took the long route to my ideal which I am now running happily after many tries, likes and dislikes and honestly just tedious small problems right up to errrr last one was Ubuntu 17.10 Mate, (which was a good try, but just an expansion of 16.04 gone wrong) I am happy ideal with Q4os with Trinity desktop! Maybe not for the recently Win convert but in the Linux world I find KDE hard to beat! The first thing that you can see when the boot sequence finishes, is an error message.